Mr Hsg is still full of cold and is clearly not up doing much. Sitting reading, I suddenly realised it was New Year’s Eve, and that it is Monday! I love how these are put together! 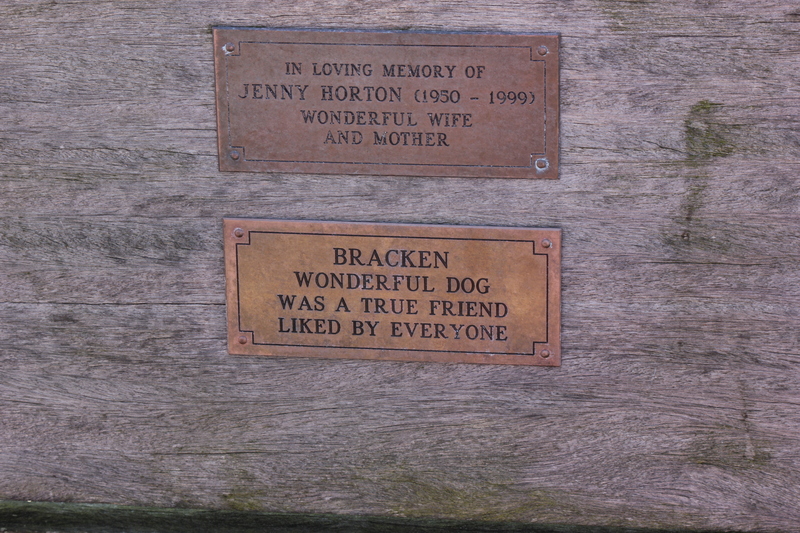 Touching tributes to our closest loved ones, on the Pier at Clevedon, near Bristol. Yesterday was a day of chores. Mr Hsg is full of cold, he has ‘man flu’. The rain was torrential and it was windy. The Marina staff turns the water off in November, to stop the sudden freeze and damage to the water pipes on the pontoons. One tap at the far end of the pontoon is left on because it is heated to keep from freezing. So, Mr Hsg got dressed in his warmest wet weather gear and went outside to connect our hoses together to fill the tank. The toilet cassettes also needed emptying, something that definitely cannot be left. I offered to do all of this but he insisted that he would do it. When the water needs filling we do everything that uses water whilst filling it so that we end up with a full tank. I put the washing on and had a shower and did the washing up. The wooden pontoons become very slippery in winter, and my balance is not good, so I am really careful not to slip. Back when I was at the University of Leicester studying Psychology, I attended the British Association for the Advancement of Science conference in Newcastle. I think it was in 1995, anyway, I went to a lecture being given by psychologist Pat Rabbit on Dementia/Alzheimer’s, and he said that it was shown that people who had difficulty in closing their eyes and stand on one leg was an early indication of possible Alzheimer’s. It has been something that has stuck with me, mainly because even then I was unable to do that without falling! I used to laugh about it because I have never been able to do it. I thought it was because I was dyspraxic and had poor balance. Now, who knows!! When all the chores were done, the washing drying in the dryer, the beef stew I made the day before was heating, I made parsley dumplings and popped them in. Being gluten intolerant, I can’t use suet because they add flour, and gluten free flour does not always perform well. Mr Hsg had a hot shower, sat by the fire (we have a multi fuel stove in the corner at the bow) and I served him up hot stew with dumplings which turned out quite yummy. My brother, who is 11 years younger than me (I am 59) phoned, we are close and I know he is having difficulty with my diagnosis. “When will you have more tests and get a prognosis” he asked. “I have had all the tests and the prognosis is unknown, 5 to 15 years if I am lucky before I am no longer me” I answered him. He then reminded me he sees his consultant on the 2nd Jan, because they say his frontal lobe has shrunk. He has had episodes similar to epilepsy. He said he had spoken to our Dad who is very worried about my brother now because of my diagnosis. Me too, hopefully it will not be of lasting seriousness. We will have to wait and see…. Today I spoke to my Dad. I couldn’t bring myself to talk to him over Christmas, I didn’t want to talk about anything to do with losing my mind. Today I told him I Alzheimer’s, he was shocked, and started talking about the sadness of caring for my mother who has vascular dementia, brought on by mini strokes. I wanted to say – stop it I don’t want to hear how awful it is to care for someone with dementia. He said “she lays the table with the wrong knives and forks and that is sad, it is the little things that upset me”. It makes me feel so guilty that Mr Hsg will have to deal with things like this. I don’t want him to be tired because it is hard work, I don’t want him to wish he had never married me. The guilt I feel is heavy. It is easy to say, that he married me because he loves me, he didn’t sign up to be a carer of someone who will lose their mind. I keep waiting for someone to say, sorry we got it wrong…maybe I dreamt it and will wake up and it will be different. I think I need this short, private, silent, time to rage and despair inside, whilst I quietly accept it on the outside. Soon it will no longer be new news to me, and will be “as it is”. Didn’t get dressed on Christmas Day. It was lovely having my daughter C with us..even if she just spent most of her time on her phone/twitter or kindle reading!! I spent most of the day cooking and washing up, just a normal Christmas really. I feel a need to try and enjoy every moment but in a quiet way. I love being away from everyone and the hustle and bustle of towns and cars. I love the quietness of being on a boat, listening to the rain on the metal roof, feeling the boat bob up and down when the wind is strong. Hearing the birds, the ducks arguing. The canada geese with their damaged ‘angel wings’, forever stuck in marina, starting to exert their dominance. I really wasn’t interested in presents, for me it was having my daughter with me. The run up to Christmas was fairly traumatic with hospital appointments and the fear of the diagnosis to come. I did not trawl round the shops for little gifts, finding those special little gifts that Mum’s find for their children. I fear C was a little disappointed, but got what she asked for and even though knitting needles and a bag is not the most exciting it is a lasting present..and of course I will pay for some wool to start her off. We got dressed….and headed off into the rain to Bakewell in the Derbyshire Peaks. C’s feet froze and we walked round looking for some thermal socks for her. There were a lot of people despite the weather. We sat in a coffee shop and I took pictures of C..I had told her I wanted to start a ‘Memory Book’ before I could no longer remember who anyone was. I know it was a hard thing to say because it brings home the reality of what is wrong with me for her. I lie in bed at night and it breaks my heart that time is limited for me being ‘with’ the ones I love. Am I noticing my memory and other difficulties more because I know it will get worse? My hearing is not quite right now. I am unable to process more than one sound at a time. Don’t bother speaking to me when I am listening to the radio, tv, or music because I can’t get what you are saying. We had to get up before the crack of dawn to take C to Birmingham Coach Station because she did not book her return ticket early enough for anywhere closer!! I miss her when I am not near her. Living in the city her life is fast paced, friends, a good social life, and life full of interest. It feels sometimes we are worlds apart, but she has always liked the culture of London Life rather than the quiet country life I prefer. Looking across to where HS2 will thunder noisily through! Yesterday my daughter C came to stay on the boat. She phoned me the night before and we booked the train. Then in the morning she phoned to say she couldn’t pick the tickets up because she needed my bank card!…..I had tried to transfer the money to her using online banking doing it on my phone, it was a real hassle but the transfer couldn’t be done before the 24th! So I booked a bus ticket and she received the ticket by text..technology eh! We went round Lichfield and went to the Cathedral to see what time the Carol Service was. We got back to the boat, I was knackered, and in pain. Fibromyalgia strikes at any time and I was in real pain..so although we were going the carol service was at 6.30pm I could not get out of the chair. Today, it has rained all day. We have sat and chilled out, watched Christmas films on tv, Its a Wonderful Life, the horror Spiderhole – which was not good. I have cooked 3 different dinners, 1. Vegetarian for C, 2. Lactose/potato free for me and 3. Anything goes for Mrs Hsgreen. I sent Viv my sister an email, knowing that she hates emails and computers etc..telling her of my diagnosis of Alzheimer’s. I am thinking a lot today of what it means and how long I have before I am not me anymore. I lie in bed at night and can’t believe..no..don’t want to believe it. I want to die before I am a burden because my mind has gone. My daughter C, took the information with seemingly acceptance as if it was an every day thing. Your mother has Alzheimer’s, Oh really, Yes, Oh dear, not to worry then….Later she said she was trying to take it in. My husband does not say a lot, but I am guessing he thinks more. We have only been married 18 months and this is not what either of us had in mind. I want to apologise to him, “I am so sorry, I did not know, I would not have put myself on you had I known”. I want to tell him not to allow me to live if I need treatment and my Alzheimer’s is advanced. Once ‘me’ has gone, I don’t want to live anymore. Oh how to say these things. Well, I have had two scans of my head. One revealed that my frontal lobe is smaller than it should be..the second that my brain shows abnormalities…….diagnosis…..Alzheimer’s. The worst diagnosis ever..the very thing I feared. I was hoping for just attention deficit..nothing more. Turns out every time my mother hit my head (most days) it damaged my brain. She has vascular dementia and is away with the fairies now. No point in being angry of what she did to me, and my life that I could have had. Time to just live each day as if its my last, live each day and hope I remember it.